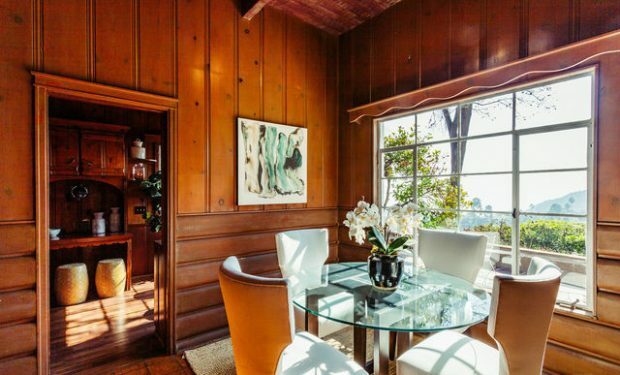 Inside you will find a wholly unique and character-filled home. 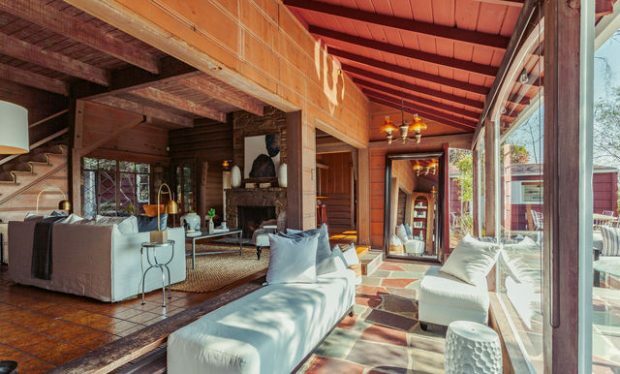 Never touched over the years, the home is at once a time capsule and a timeless rustic retreat. 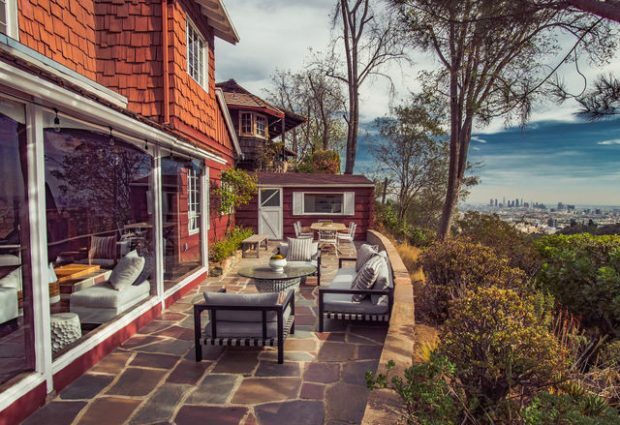 The spacious step-down living room boasts rich wood beamed ceilings, Spanish tile floors, a fire place, and walls of glass that simply present those staggering head-on city views. 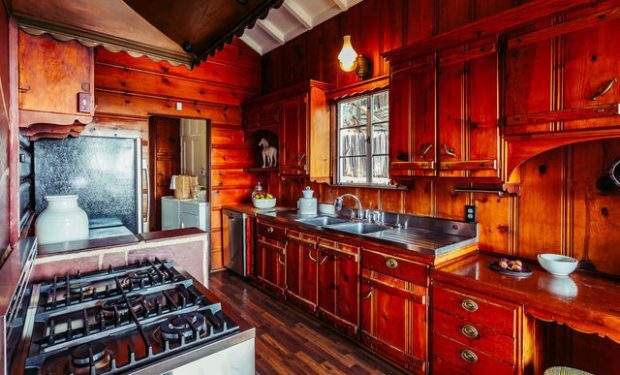 The sturdy kitchen will you take on a quick trip to Swiss Alps. Love it or imagine the unlimited options for restoration and remodeling. 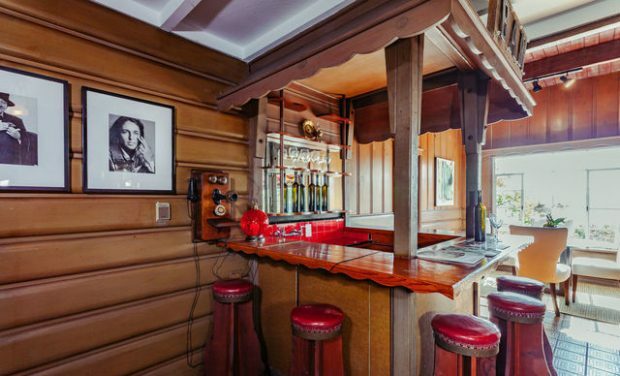 And, of course, after World War II, in the 1940s and 1950s, nothing could be more luxurious than entertaining friends and family at one-of-a-kind built-in bar. The bar sits next to the lovely dining room which has great hillside views. 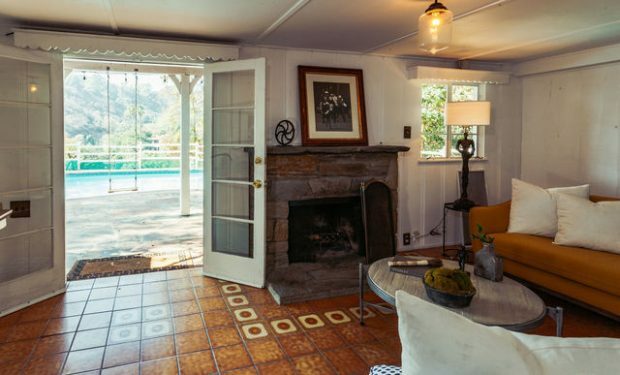 The home boasts three bedrooms including this large and sunny master. 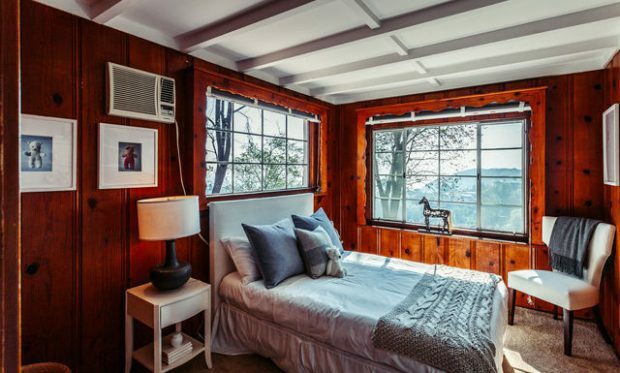 The guest bedrooms have their own quirks and charms and all of them have amazing views. 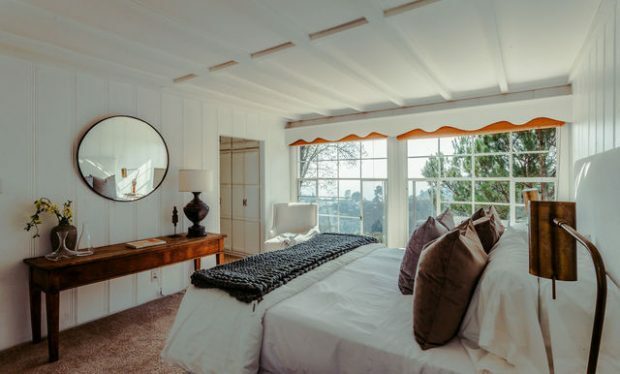 Be sure to notice the stunning ceilings on each. 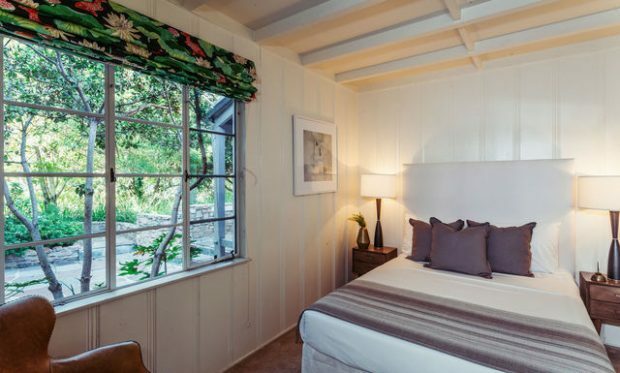 The third bedroom more closely resembles the master. 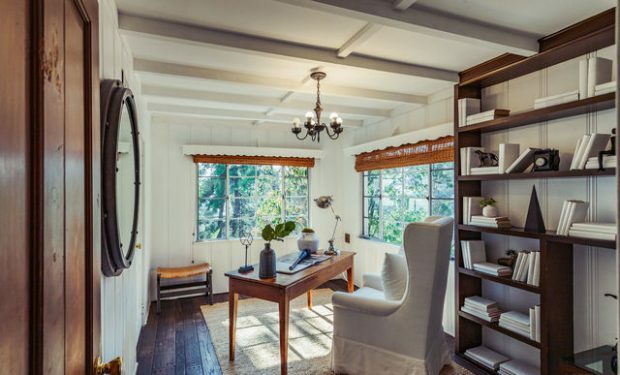 There is also an office that includes wonderful built-in bookshelves. 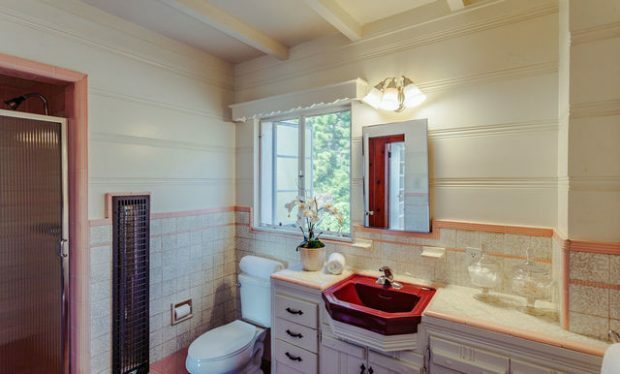 And as you might have guessed with a virtually untouched home in Los Angeles from 1949, the bathrooms are delightfully vintage and there is 2 full and one half of them. 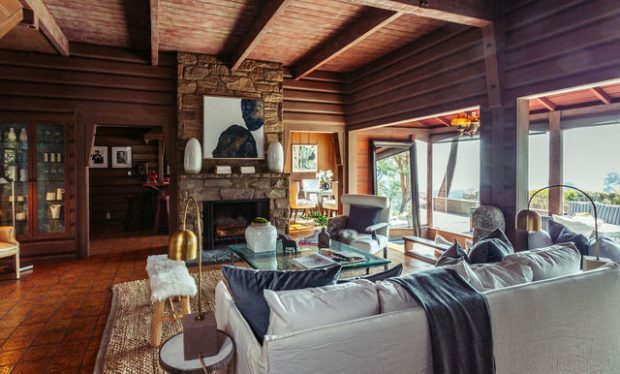 There’s also a family room and den that offers the perfect place for lounging and includes a second working fireplace. And the home keeps going. The den and the main living room and kitchen all open to the majestic terrace and pool. 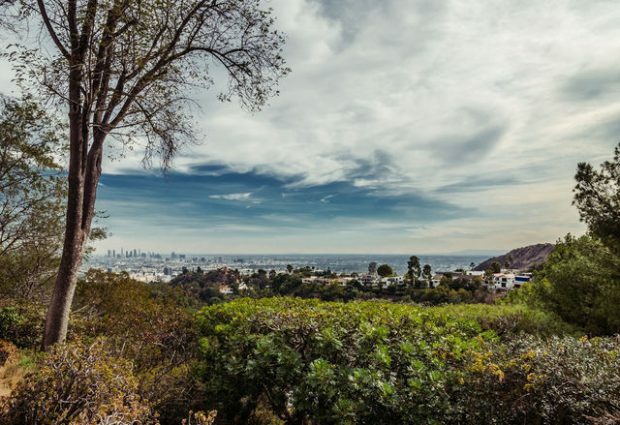 The wraparound terrace offers plenty of spaces to entertain and enjoy the incredible views of Downtown Los Angeles and the canyon. The house is set back far from the street providing zero traffic noise and total privacy. Warm and welcoming, 2780 Outpost Drive offers a once-in-a-lifetime opportunity to own a true one-of-a-kind. 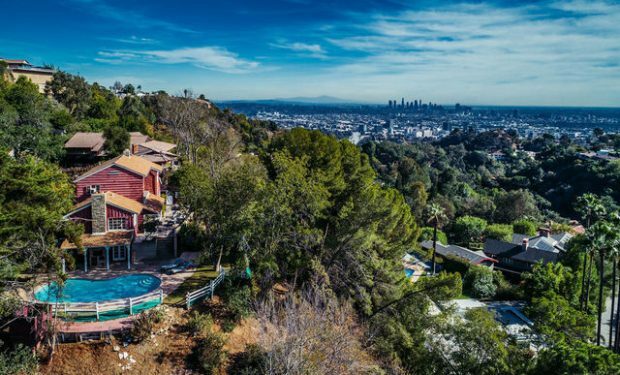 If you would like to view 2780 Outpost Drive, or view other stylish homes for sale in the Hollywood Hills, Los Feliz and Silver Lake, call me at (323) 697-3040 or email me at jacqueline.tager@sothebyshomes.com. 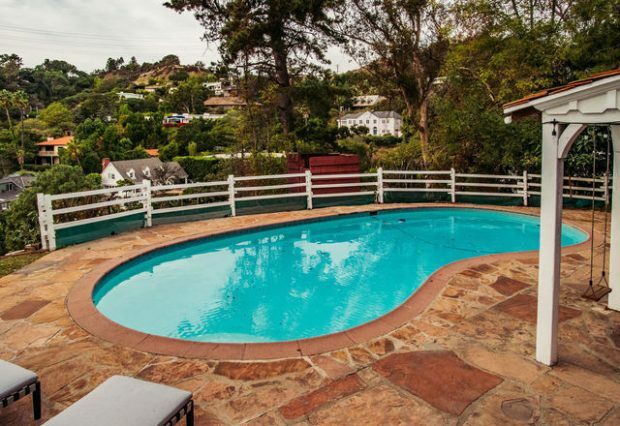 Listing provided courtesy of Neal Baddin, Coldwell Banker Residential Brokerage.